Abstemious little Cindy in the scullery. 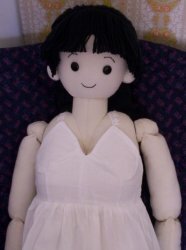 How to make a soft cloth doll. 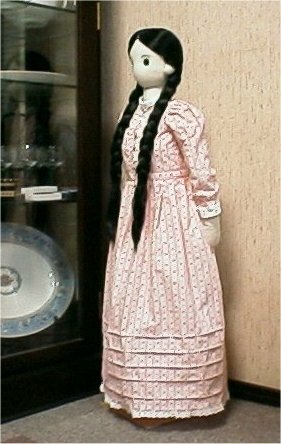 Please enjoy the photographs and comments of fully worked-out dolls which are made by visitors of this site. To avoid SPAM mail, e-mail address of visitors are not shown in this page. If you have some comments for these dolls, please send e-mail to Doku(doku@newon.org). Doku will forward your message to the visitors. State of Oregon, USA Ang's Cindy is putting on not only a cute dress but also lovely undergarment with bra caps. She has pig tailed black cotton hair. It looks very soft. I made an undergarment for her that also acts as a bra (I had never made my own patterns before). The bra cups conform to Cindy's shape perfectly. 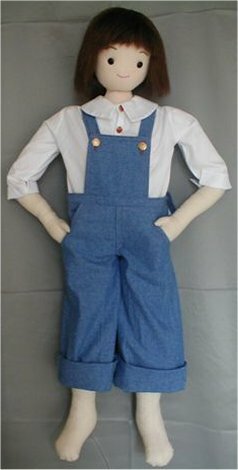 I used the cotton wig pattern the same as the other Cindy doll, and I braided the hair into pig tails. 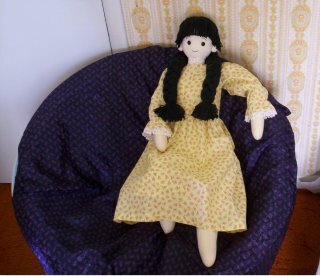 I might try to make her a fancy dress with embroidery and hand-made silk rosettes. Rio de Janeiro - Brazil Noemi is an expert of plastic ceramic miniatures. So head of her doll is made of paper clay. 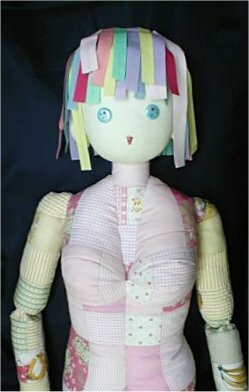 She challenged a big doll using a cindy's pattern first. Malshia is an impressive and unique doll, with chiseled face, a wonderful hat, and red shoes and gloves. 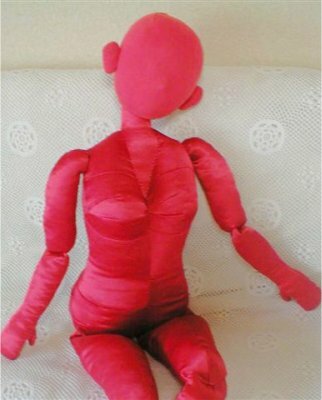 I have tried myself doing a doll and found it no difficulty doing it following step by step the pattern. My doll isn't as tall as little Cindy and the head I made in paper clay (I have modeled it myself). 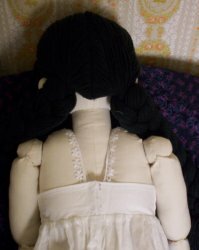 I found very difficult to attach the hair but after all I could do it and used a bonnet to finish and cover the small errors. Alphi's doll Tokyo - Japan She made a lot of wonderful dolls which based on her skill of making French doll, applying Cindy's pattern. 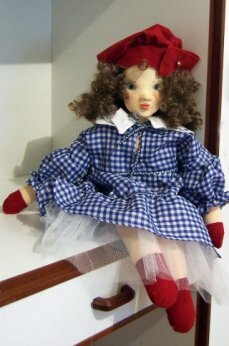 The wonderfulness of the dolls exceeds original Cindy. Since she had a grown-up atmosphere, I made a KIMONO (Japanese clothes) for her. 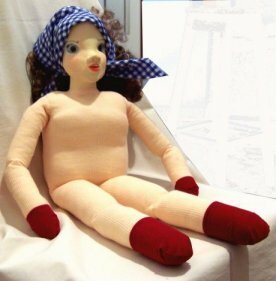 She has rather thin legs, and wears TABI (Japanese socks). Of course, she can wear a dress which other dolls are wearing. She is about 32 inch height and has five fingers on each hand. (no wire is in har finger). Her hair is made by glossy acrylic fibers. She is gentle character like the eldest daughter. She is active and boyish. Dress for a grown-up also fits her. She is 35 inch height and has five fingers on each hand (no wire is in the finger). With rather thin legs. 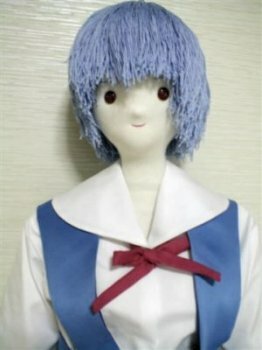 Her name is Rei Ayanami who appears in "Neon genesis evangelion". She has a soft and gentle body and will complement you to be held. She is 33" (85cm) height. Her eyes are made of red button and hair is summer yarn. I was charmed by Cindy doll. Since I thought it was regrettable to hide the breast and hip lines of her by clothes, so I sewed Cindy of patchwork. I tried to express relaxation of a lady. She is 75% of size of the usual Cindy. 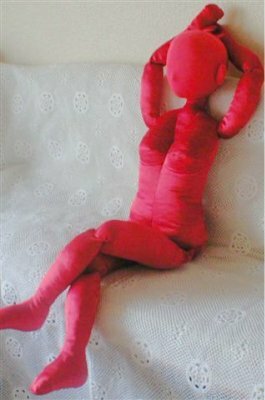 She is an evolutional red cloth doll having nice proportioned red body and moveable head. An avant-garde sofa just fits her. Dress by Mars Osaka - Japan Mars makes an endeavor for popularization of 45cm play doll. 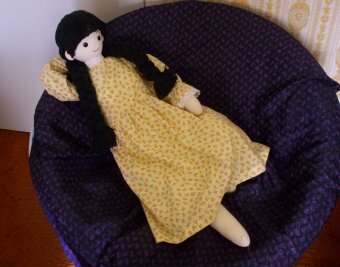 also releases many dress patterns for doll can apply for various dolls. 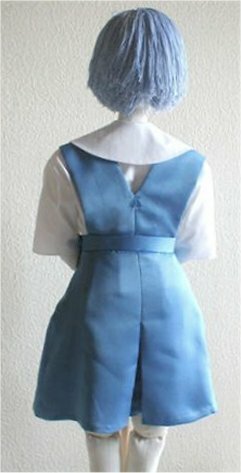 Since the skirt has many pin tucks, the skirt spreads gracefully. Since the dress has the sleeve which swelled in the portion of the shoulder, the lace at the bosom, etc., it is very pretty. 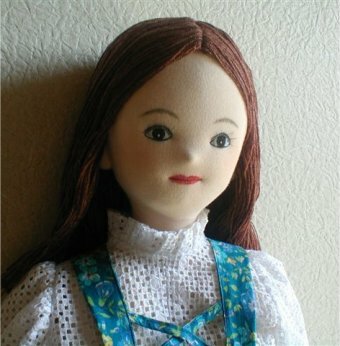 If you like, Please send pictures of your Cindy or pictures of a doll using Cindy's methods for this page. Please write the contents of the following list with pictures. These pages are originally written in Japanese, and translated into English. Original Japanese pages are here.